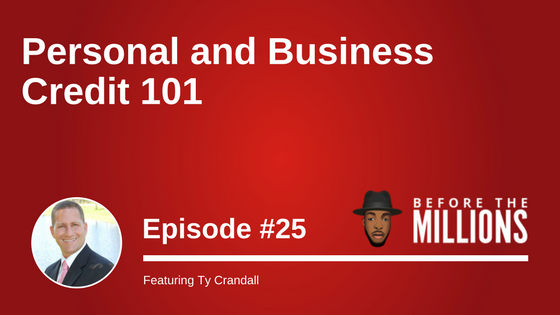 On today’s show, we welcome entrepreneur and business credit expert, Ty Crandall. Ty has been in the financial space for over 16 years and is widely recognized as a business authority in credit building, credit scoring and business financing. He is an international speaker and the CEO of Credit Suite, the biggest credit coaching operation in the United States. He is also the author of two books, Perfect Credit and Business Credit Decoded. In this episode, we hear more about Ty’s journey as an entrepreneur and how losing everything changed the way he does business today. Ty explains some of the key concepts of credit score; such as how to fix damaged credit quickly and gives a few secrets to getting approved for a credit loan, even when the bank denies you. If you don’t know what business credit is, by the end of this episode, you’ll know exactly what it is and how you can use it to jumpstart your business. Ty takes us back to his college days. Getting to know your strengths and weaknesses. The importance of preparing for opportunities and taking risks. Ty’s first entrepreneurial journey in his early twenties. How losing everything changed the way Ty did business forever. Ty’s lowest entrepreneurial moment and how he got out of it. What you can start doing today to improve your credit. Why enquiries don’t necessarily lower your score. What is the impact of length of credit history? What is business credit and when to apply for it? Credit loans available for real estate investors. What to get in order before applying for credit. Handling adversity as an entrepreneurship. How to get approved for a credit loan. Managing your credit loan once you’ve got it.